Loving Heart Multi-Service Centre (Jurong) was set up as a one-stop social service centre and its programmes and services aim to reach out to a wider community in Jurong. With the vision of assisting children from less-privileged background achieve a meaningful level of academic attainment and eventually progress to further education, Loving Heart Multi-Service Centre (Jurong) Free Tuition programme has supported numerous students from Primary 1 to Secondary 4 under this programme since 2005. 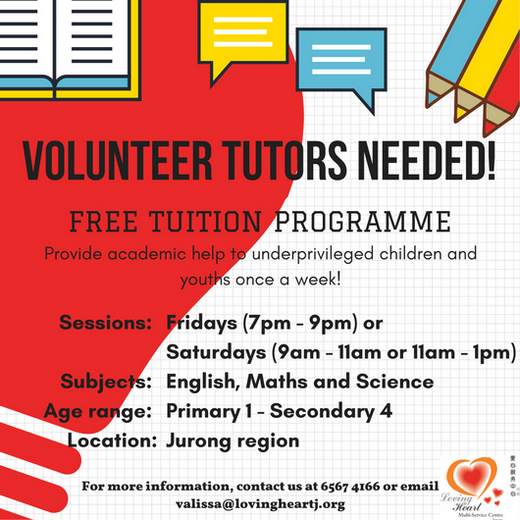 The Free Tuition programme provides individualized tuition in English, Math and Science to 80 school-going children from low-income families over a weekend across 3 sessions on Fridays (7pm – 9pm) and Saturdays (9am – 11am & 11am – 1pm). The centre aims to provide these children with academic supervision and guidance to address their declining academic performance. Please contact Valissa at 6567 4166 or valissa@lovingheartj.org for further enquiries.